Both Espresso and Cappuccino are coffee but there are certain differences between these two. Normally American coffee is brewed by mixing hot water with the grounds of roasted coffee beans. Regular coffee is made using American coffee by mixing milk or cream with sugar. Coffee beans are of two types, Coffee Arabica and Coffee Robusta. Both espresso and cappuccino gained the popularity as a beverage consumed after dinner in America. Espressos is made by same type of coffee beans used in American coffee and is roasted in the same way as that of American coffee. The coffee used for making espresso must be finely ground than the American coffee. Espresso is consumed in Italy and most parts of Europe. Superior coffee blends like Arabica and some times darker roasted beans are also used to make espresso to get stronger flavor. The brewing technique makes the espresso special. To prepare espresso, an espresso machine is needed. Espresso is made using pressurized brewing process and as a result of this, the coffee is very much concentrated with all flavors and chemicals. Espresso is brewed by compressing the finely ground coffee in to a dense ‘puck’ of coffee and the hot water is forced under high pressure through the puck of coffee to get the extraction known as espresso. 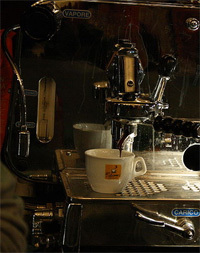 The right temperature, pressure and the time required for the extraction is maintained by an espresso machine. Except for making other drinks, espresso is never mixed with milk or cream. Espresso is used as the base of other drinks like mochas, macchiato, lattes and cappuccino. Cappuccino is an aromatic coffee mostly consumed by people of Italy in the morning. Cappuccino is made by mixing milk, steamed milk foam and espresso. The milk is frothed in to microfoam which is about twice the volume of original milk using steam wand which is also a part of espresso machine. To make cappuccino, mix equal volume of milk and espresso and then microfoam is poured over the espresso. Pour the steamed milk first in to the cup, then pour espresso and after that top the mixture with frothed milk. One of the major differences from espresso is to add a sprinkle of cinnamon or cocoa powder to the cappuccino. Cappuccino is not just a mixture of steamed milk and espresso as you can make many varieties of this beverage. You can use skimmed or soy milk as an alternative for low fat in cappuccino. To get a different taste, you can add flavored syrups like orange, vanilla or Bailey’s flavor. You can also use chocolate syrup or powder to make a delicious combination of cappuccino. Skilled coffee makers make small designs on the froth at the top of the cup. lancedeepa. "Difference Between Espresso and Cappuccino." DifferenceBetween.net. August 25, 2009 < http://www.differencebetween.net/object/difference-between-espresso-and-cappuccino/ >.